Last edited by clashmore_mike; 12-19-2018 at 08:18 AM.. Visited for Wake Forest. Great film, classic FS but also the size and skill set that Elko has targeted in the past for Rover. Goes to an elite Catholic Prep school in ATL. 10-0 team and Top 30 by Maxpreps even though they are in 4A (out of 7A). One to watch going forward. With his highlight production, physical skill set and area projects him to be a 4 star all day. What do the schools know that we don't that it's this far into the cycle and he has limited schollies if he appears to be this good? The offers are even low for someone "under the radar"
Last edited by beryirish; 11-07-2017 at 08:22 AM..
Arrowryan posted this in the master list. We should go after every single recruit in the country who has offers from both Clemson and Princeton. 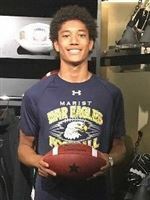 Atlanta (Ga.) Marist School three-star safety Kyle Hamilton is the latest class of 2019 recruit to add an offer from Notre Dame. The 6-2, 185-pounder adds the Fighting Irish to an offer list that includes Clemson, Duke, Iowa State, Northwester, Virginia, Wake Forest and a few others. Hamilton was in South Bend back in November for game day against Wake Forest and was impressed with what he saw. Following today's offer from safeties coach Terry Joseph, Hamilton had this to say. "Feels great," said Hamilton, who added he can still see himself playing for the Irish. "I am going to get up there and visit soon." Hamilton was also impressed with the play of the defense. Now the opportunity is there. We'll see what comes next for the Peach State native. Had 6 Int's and 8 PBU's. Probably over 90 tackles. Had 300 yds receiving. The exact kind of long & productive WR/S that Lea went after for his Rovers. If ND could land him, Ajavon and Watson (I know he's getting a shot at CB like Houston but he has safety covered if need be) they would have back to back to back loaded Safety/Rover classes that will allow Lea to develop them and let the players flexibility dictate where they ultimately land, not forcing someone into a spot out of need. And when someone gets hurt or transfers... so what. We've waited a long time to get the DT's and Safeties fixed and it's happening right before us as we type.